“The Kalmyks are the only indigenous Buddhist people in Europe. They speak an endangered Mongolic language and possess a highly developed oral, musical, and dance culture, centered around the epic tale Jangar. 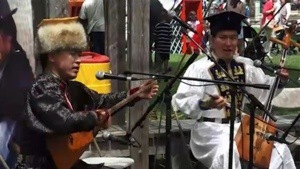 Musicians performed segments of the epic at the 2013 Smithsonian Folklife Festival. An informal dance followed”. By Kalmyk Brotherhood Society in News on July 1, 2013 .